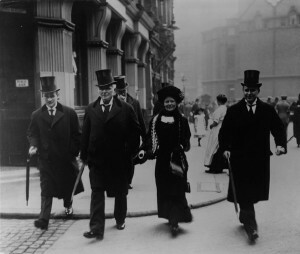 The British Inquiry began on the 2nd May 1912 led by Wreck Commissioner Lord Mersey in the Scottish Drill Hall, London, near Buckingham Palace. 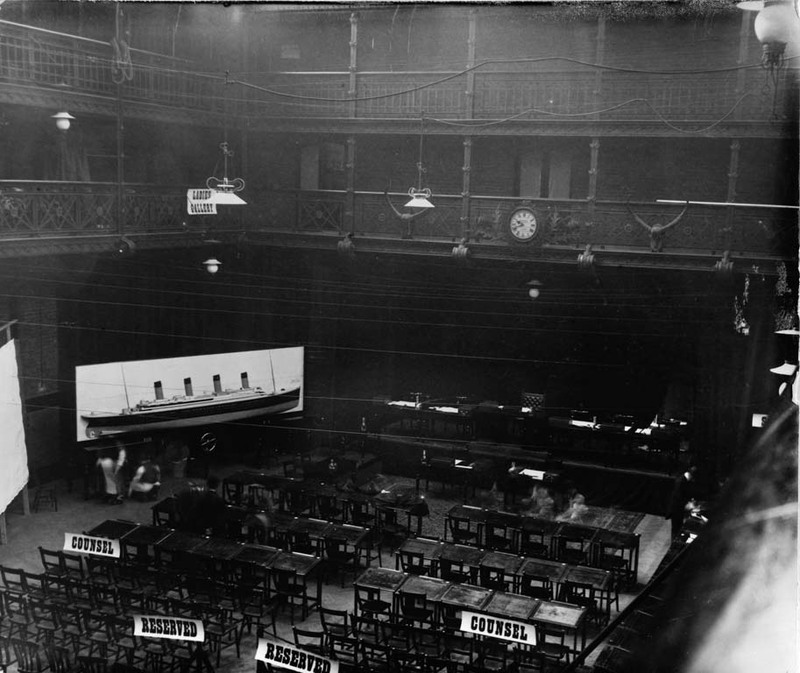 Despite complaints of bad acoustics in the hall, the Inquiry continued for 36 days, attempting to answer 26 key questions about Titanic’s construction, events leading up to and during the fateful night and the presence of the Californian. 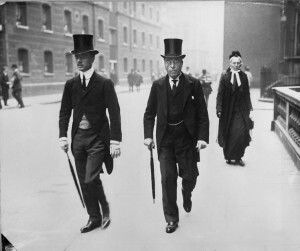 Left WreckCommissioner Lord Mersey (right) and his son Captain Bigham, Secretary, whose duties included finding a location for the Inquiry. Right Hon. Alexander Carlisle, at the Inquiry. Left The Right Hon. Sir Alexander M. Carlisle, general manger at Harland & Wolff until 1910, and initial designer of Titanic. Carlisle had previously commented on the lack of sufficient lifeboat provision and designed Titanic to carry many more boats than the twenty she sailed with. 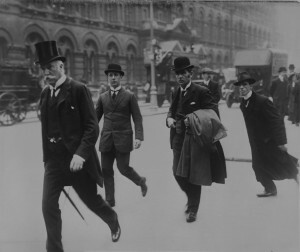 Right Harold Sanderson (far left) Chairman of White Star’s board of directors, and Captain Herbert J. Haddock of the Olympic (holding coat). After 96 witnesses had been asked 25,622 questions, the Inquiry considered various technical reports and officially closed on the 3rd July 1912. 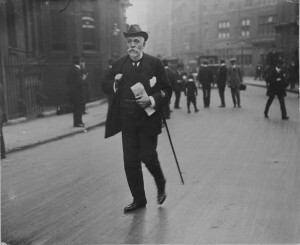 Lord Mersey presented the court’s findings on 30th July, briefly summarised as criticising the speed Titanic was travelling at given the conditions of the evening, the lack of adequate provision of lifeboats and arrangements for manning them, and Captain Lord’s failure to bring the Californian to the rescue. The question of discrimination against third class passengers was never really addressed in depth, and failed to reach the attention of the media of the day.